Can We Bounce Off The Moving Averages Again? One of my fond childhood memories is skipping stones off a lake. It took me a while to learn the trick but I realized that it required a few key variables: a calm body of water, a smooth flat stone, and just the right wrist twist as you release it horizontally. Pretty soon I was counting the skips I could get and trying to best it. A bull market is similar in many ways. It tends to go in a trend (direction of the stone). It requires a few key variables (economic growth, friendly monetary policy, etc.). It tends to “skip” off the surface (bounce off a moving average). And there is an end where it succumbs to gravity (rolls into a bear market). Ever since equities lifted off from the abyss of the bear market in 2002, we’ve seen the market ricochet off its moving averages and go on to higher levels. 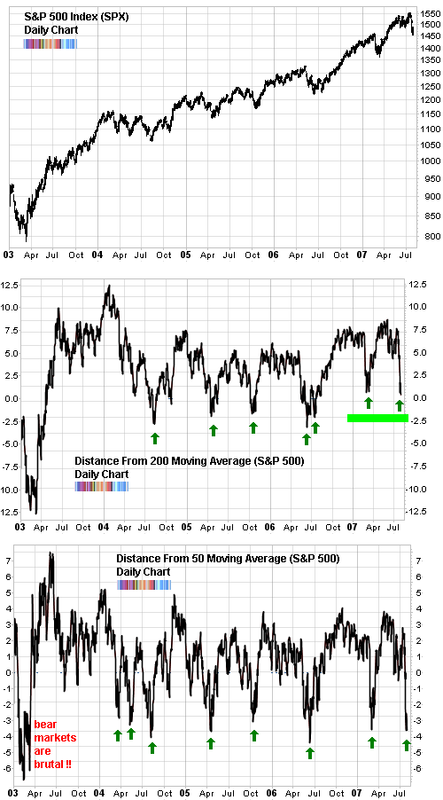 I’ve charted the distance from the 50 and the 200 day moving averages below. We are right where we should be for the medium term moving average. Having seen this scenario play out about 7 times before, it is all too familiar. As you’ll notice, the only time we were farther below this moving average was at the throes of the bear market. That, I hope we can all agree on, was not a run of the mill event; so it is understandable that we haven’t repeated it. In contrast, we are still a bit too high off the longer term moving average. The previous 5 times we were in this area, the market dipped slightly below this average. We aren’t there yet. Since the last correction was shallow, it does not guarantee that this one will be also. At best, we can say that we are near an inflection point according to this measure as well. The May 2004 scenario may also be relevant. As you can see on the chart, back then the distance from the 200 day moving average was similar to now. The market did bounce into a tradeable rally but then it rolled over again and found its final bottom in August 2004, slightly lower. Of course the market doesn’t have to do anything. I try my best to always keep that in mind as I analyze it. All we can do is to study it and learn from its past behaviour. I prefer this than going with a hunch or a gut feeling. But it doesn’t mean that I’m stamping my foot demanding something from the market. It is more like a dance. The market always leads and you try to do your best to keep in step.